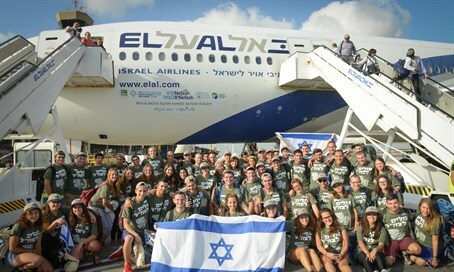 230 olim from North America, among them 59 lone soldiers, arrived in Israel aboard a Nefesh B'Nefesh charter Aliyah flight. 230 olim, among them 59 lone soldiers, arrived in Israel Tuesday morning aboard a Nefesh B'Nefesh charter Aliyah flight Tuesday morning. The new olim were welcomed at the airport in a special ceremony attended by Housing Minister Yoav Galant. The new arrivals landed in Israel on a Nefesh B'Nefesh charter Aliyah flight, and hail from the US and Canada. They include 29 families with 75 children, as well nine couples and 86 singles. The flight was facilitated in cooperation with Israel’s Ministry of Aliyah & Immigrant Absorption, the Jewish Agency for Israel, Keren Kayemeth Le’Israel, JNF-USA, and Tzofim-Garin Tzabar. The lone soldiers will join 850 others from the US and 2,800 lone soldiers from around the world currently serving in the IDF. Nefesh B'Nefesh, in cooperation with Friends of the IDF (FIDF) will continue to offer the lone soldiers guidance and support during each stage of their service from pre-recruitment to adjusting to civilian life after their release.